A History of Dogfighting The origins of dogfighting can be traced to a clash of the ancient Roman and British empires. The practice is illegal in most of the world but remains popular. The genesis of dogfighting as a sport can be traced to a clash of ancient civilizations. When the Romans invaded Britain in 43 A.D., both sides brought fighting dogs to the battlefield for the seven years of warfare that followed. The Romans may have won the war, but the British dazzled the victors with the ferocity of their dogs, which were far more battle-ready than their Roman counterparts. Thus emerged a canine market of sorts. The Romans began to import British fighting dogs for use not only in times of war, but also for public amusement. In Rome's Colosseum, large audiences would gather to watch gladiator dogs pitted against other animals, such as wild elephants. The vicious dogs, thought to have been crossbred with the Romans' own fighting breed, were also exported to France, Spain and other parts of Europe, eventually finding their way back to Britain. By the 12th century, the practice of baiting — releasing fighting dogs into the ring with chained bulls and bears — had grown in popularity in England. For several centuries, baiting was considered a respectable form of entertainment among the English nobility. The practice, during which the dogs scratched and bit the bulls, was also used to tenderize meat for consumption. But by the early 19th century, the increasing scarcity and rising cost of bulls and bears, as well as growing concern about the issue of animal cruelty, damped the appeal of the sport. In 1835, the British Parliament outlawed all baiting activities. Following the law's passage, dog-on-dog combat emerged as the cheaper, legal alternative to baiting. Fighting dogs were crossbred with other breeds to create a fast, agile and vicious animal capable of brawling for hours at a time. Fighting dogs were imported to the United States shortly before the Civil War and were crossbred in hopes of creating the ultimate fierce canine fighter: the American Pit Bull Terrier. Dogfighting quickly became a popular spectator and betting sport in the U.S. and parts of Europe, Asia and Latin America. But concern about the humaneness of dogfighting grew, and by the 1860s, most states had outlawed the sport. Nonetheless, it continued to flourish into the 20th century, with widespread support from the general public and police officials. Though legal in Japan and parts of Russia, dogfighting has been outlawed in most of the world. Still, it remains popular. 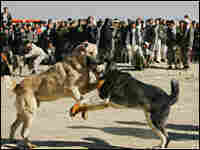 Legal or not, dog fights are held openly in parts of Latin America, Pakistan and Eastern Europe, and clandestinely in the U.S. and the United Kingdom. Wayne Pacelle, president of the Humane Society of the United States, estimates that at least 40,000 people are involved in the industry domestically. He calls today's dogfighting the modern-day equivalent of the ancient Roman Colosseum battles. In Afghanistan, too, the dogfighting industry has seen a resurgence, after virtually disappearing under the Taliban, who outlawed the sport to prevent betting – which is not permitted in Islam. Animal cruelty arguments don't carry much weight in Afghanistan, where dogfighting is a big business and a source of income for the owners of champion dogs. The industry is also booming in the U.S., concentrated in urban areas and the rural South. Nationally, about 30 percent of all dogs in animal shelters are pit bulls, the breed used for dogfighting; in some areas, that figure can climb to 60 percent. Not all rescued pit bulls are involved in the practice, but John Goodwin of the Human Society of the U.S. says that many bear the hallmarks of the industry: a fight-crazy disposition and the scars to prove it. Rescued dogs are kept at animal shelters until a judge makes a determination on the dog's fate. Because fight dogs have been bred to attack and kill other dogs, almost all of them are euthanized. There are no definitive figures on how many fight dogs are rescued in the U.S. annually, but Goodwin says that about 4 million dogs in shelters are euthanized each year.